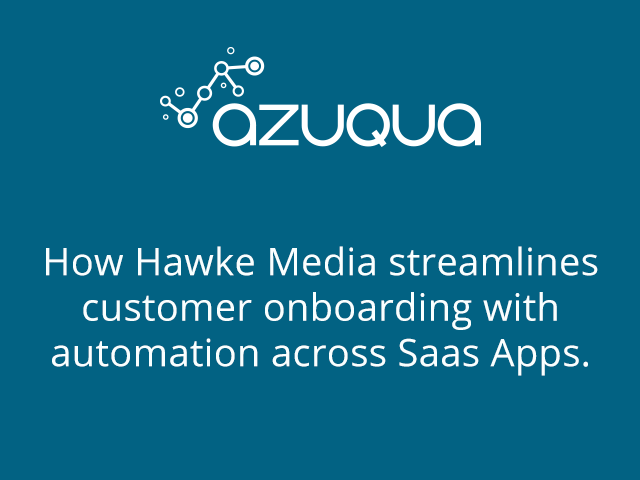 Hawke Media experienced a similar challenge when onboarding customers with their sales team using Husbspot and their client onboarding teams operating out of Wrike. Every time they signed on a new client, their sales team completed a form with customer information for onboarding. The onboarding team then double checked for accuracy, manually copied form data, created accounts for each customer within Wrike, and built and assigned repetitive task structures from scratch. There were some obvious problems with this process for Hawke Media -- their client onboarding team wasn’t adopting Wrike at the rate they would have hoped because there was often missing information and the manual workload was limiting their ability to scale their client onboarding processes. Learn about Mediaocean’s experience with Zendesk and how they created a Salesforce integration with Azuqua that was above and beyond their expectations. Join us for an honest conversation with Stephanie Dorman (SVP of Client Services, Mediaocean) to hear how using the right tools can improve product adoption and increase customer satisfaction. As the number of SaaS applications grows so do the challenges involved in syncing data and automating mission-critical business processes - leaving teams, data, and ultimately end customers in a disconnected state. Jeff DaSilva, Sr. Business Automation Analyst at HubSpot, and Nico Rodriguez, Sr. Business Systems Analyst at HubSpot, were able to find a single solution in Azuqua that not only solved HubSpot’s initial integration challenge, but has since evolved into empowering an entire team tasked with transforming processes company-wide - automating nearly 100 business processes and reducing time spent on manual data entry between SaaS applications by 90%. - Why HubSpot chose Azuqua to unify its ecosystem of SaaS apps, databases, and homegrown applications. - How a single Azuqua solution evolved into a Center of Excellence dedicated to building solutions company-wide. - How HubSpot is using Azuqua to create and deploy 100+ automated processes around their customer journeys. Azuqua helps you connect your SaaS apps and automate your work. Azuqua helps the world’s leading companies connect their applications and automate critical business processes so they can deliver better experiences for their customers and eliminate manual work for their employees.